This cake is a true game changer. Let me just start out by highlighting that. Whether you are celebrating a birthday, the weekend or just simply celebrating life then this is the cake you need to make. This rich, thick chocolate cake really is perfect for any occasion and it is a real crowd pleaser. It really is so good, that people don't believe that it doesn't have any white flour, refined sugar or butter/any other kind of dairy. It's clean, wholesome ingredients that come together to make something absolutely delicious. My perspective on cake still stands. If you really want that traditional birthday cake you've had since you were 5 or maybe some fancy cake from the local baker that you have just been dying to try - then do it! If that is what you really want, then that is what you should have on your day or any other day that you are celebrating with a little cake. With that being said though, I still wanted there to be a cake that was clean. With celebrating my 22nd birthday this past weekend, I figured it was the perfect excuse to create this Rich Paleo Chocolate Cake! Now I am sharing the recipe with you, so that you can make a little cake for your birthday or party or guests this weekend (or just for yourself - just don't eat it all in one sitting). Topping with the berries is really key too! The contrast of the richness of the chocolate cake with the freshness of the sweet berries is perfection. It just finishes it off really nicely. Give it a try and let me know what you think! I have gotten so many requests for this recipe and I am sure it won't disappoint! 2. Measure out your three flours, almond, oat and coconut and combine with the other dry ingredients (coconut flakes, cocoa, coconut sugar, vanilla, salt and baking soda) in a medium bowl. Mix it all together. 3. Melt your coconut oil in a large bowl over boiling water. Once the coconut oil is melted, add the maple syrup, almond milk, and eggs. 4. Gently pour the dry ingredients into the wet ingredients. The best way to do it, is by pouring a little in, then stirring and repeat that until the mixture is properly mixed. The dough should be moist - so not soaking wet and not dry. Find a happy little middle spot. 5. Coat your 23 cm round cake pan with coconut oil (really get that stuff all over the place, so that the cake doesn't stick to the pan). Cut out a round piece of baking sheet that fits the bottom of the cake pan. 6. Pour the batter into the cake pan and smooth out the top. 7. Bake in the oven for 40-45 minutes. 8. Let the cake cool completely before you remove the cake from the cake pan! Very important, so that the cake keeps it's shape. Bonus: if you want to make a little chocolate topping (as seen in pictures) melt 1 1/2 bars of dark chocolate (70% is best) with a 3 tbs almond milk and 1 tbs coconut oil. Once the mixture is melted, pour it on the middle of the cake and let it cover the whole cake. Use a cake spatula to spread out the chocolate if you need too. If you want the cake to be completely paleo then you obviously have to use sugar free, pure chocolate. But with that being said, it's totally not necessary but it does give a nice little extra "crunch". 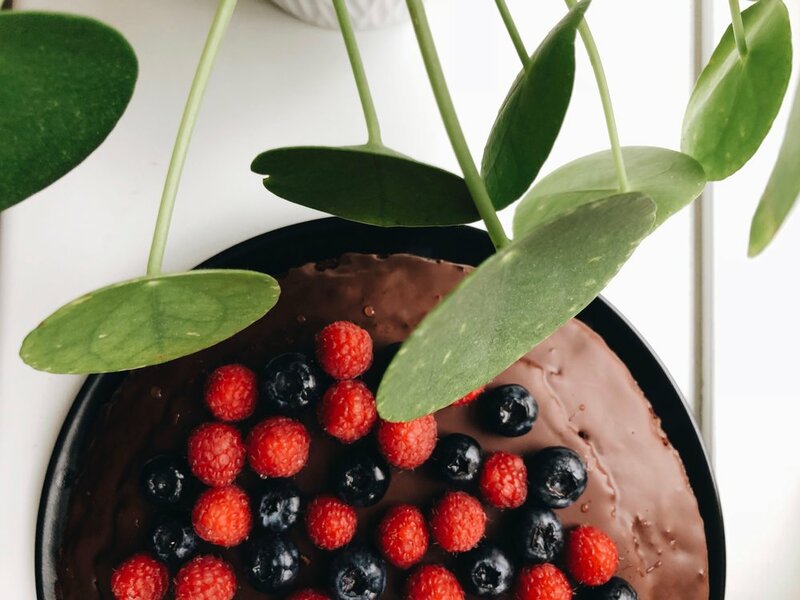 Then top it with fresh berries and you will be serving and enjoying one fantastic, mouth watering, rich cake that none of your guests will think is white flour free, sugar free, dairy free, gluten free and addative free!